Mac mini-applications known as widgets help you get a quick snippet of information. Widgets generally serve a useful and singular purpose: from letting you track an overnight package to finding out whether your favorite team covered the spread. 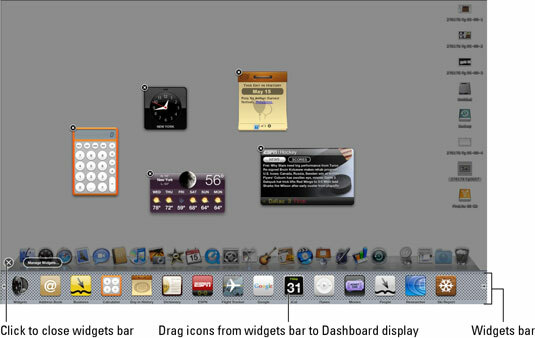 Fronted by large colorful icons, your Mac’s widgets appear when you summon Dashboard. This translucent screen lies on top of your desktop. Nothing underneath is disturbed. To open the Dashboard and access the Mac widgets, you either click the Dashboard icon in the dock or press the F12 key or F4 on the new Apple aluminum keyboard. Pressing the key again closes Dashboard. You can exit also by clicking anywhere other than on a widget. When the Dashboard appears, only the widgets you previously used are on-screen, right where you left them. The rest are in the widgets bar, which you can open by clicking the + button. If you want to enlist one of the widgets, just drag it onto the Dashboard area. It will dazzle you with a ripple effect as it makes its grand entrance. Click the X button to close the widgets bar. Pressing F12 again closes Dashboard. You can exit also by clicking anywhere other than on a widget. Although you can perform many of the widgets’ tasks through the Web or other programs on your desktop, few do it with the convenience and flair of widgets. To get you started, Apple supplies a collection of basic widgets (calculator, clock, calendar, weather). Thousands more widgets, many of great interest, are available online. 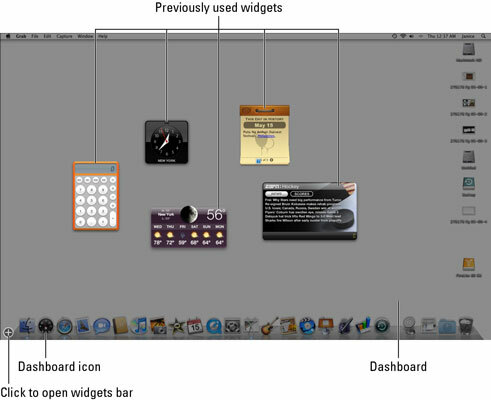 You can find more widgets at the Apple Web site. Or right-click the Dashboard dock icon and click More Widgets.